My Datura bloomed last week and I missed it! The seed pod is cool though! 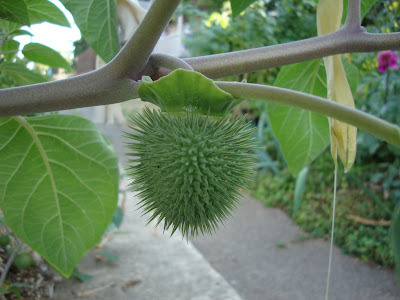 I'd definitely try to overwinter Datura seedlings by lifting and potting them up. It has not survived here in the ground. 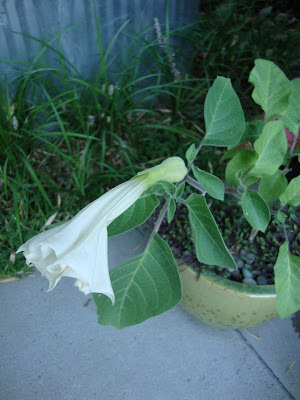 I've never grown datura, good luck overwintering it. I have a poor track record with overwintering, our garage is too cold and our basement too warm (and I forget to water). Oh, well! At least you got a bloom. I didn't manage to get one this year, and some sort of bug has started feasting on the foliage. The seed pods are wonderful, I would grow it just for those, if only I could get it that far along. 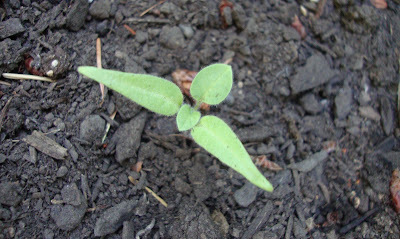 If the overwintering doesn't work out, I have had good results starting them from seed in the early spring. Wicked Gardener, don't you hate that! How dare they put on the display when you are away! BATGT, really? For some reason I thought they did winter over in SF. So sad! Congrats on the award! I was away this weekend and haven't had a chance to respond. I will email you tonight! VW, I grew one (my first) in Spokane on my patio. I think I bought it at Hangmen Creek nursery (years ago!) They are fabulous plants and worth the effort even if you only grow them as an annual. Grace, thanks for the encouraging words. I guess I really have nothing to loose by trying! Megan, I noticed tonight that my 1 bloom is starting to form a pod, yea! I'll share some seeds with you. Ricki, do you buy your seed or get it from one of your plants?